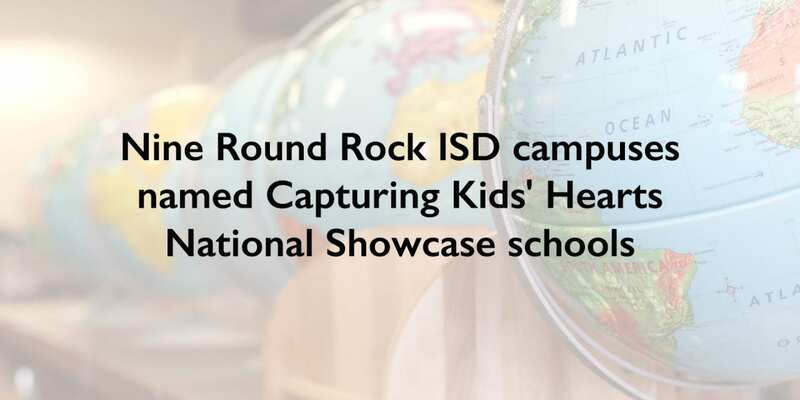 Nine Round Rock ISD schools received the Capturing Kids’ Hearts National Showcase Schools award for the 2018-2019 school year from the Flippen Group. This award recognizes campuses that have proven to focus on campus culture and support emotionally safe environments. Anderson Mill, Berkman Arts Integration Academy, Callison, Forest North, Old Town, Union Hill, Voigt Arts Integration Academy, and Wells Branch Arts Integration Academy and Walsh Middle School were all recognized this year as earning this title. This is the third year in a row that Voigt, Union Hill, and Forest North received the award and the second for Wells Branch. According to the Flippen Group, Capturing Kids’ Hearts is a transformative initiative for campuses to become an emotionally safe and relationally connected place for students, staff, and parents to come alive with love for learning. As part of the Capturing Kids’ Hearts program, teachers and staff learn processes to connect students with their peers and adults on campus and create classrooms where students are excited to enter and learn every day. Capturing Kids’ Hearts campuses were considered for these awards based on the following criteria: nomination based on observation, level of implementation of Capturing Kids’ Hearts processes by all staff as measured by online surveys and data demonstrating that Capturing Kids’ Hearts has made a significant improvement in attendance, discipline, climate/culture, or academics. A Flippen Group team visited each nominated campus to gather data, and to interview students, teachers, administrators, and parents. They used a matrix of key measurements to gather information during the campus walk-through. Finally, an additional survey was conducted to collect feedback regarding the perceived climate and culture of the campus and its conduciveness to learning. Following this visit, the selection team reviewed all data and selected the campuses to receive the Capturing Kids’ Hearts National Showcase Schools awards.